I have always thought that onions are not accorded enough respect. Maybe because they are so commonplace, the basis of almost every soup and stock and stew? Or maybe because they are season-less, and we have gotten used to their abundance? They certainly aren’t precious, like the cherries of spring, or the figs of fall. 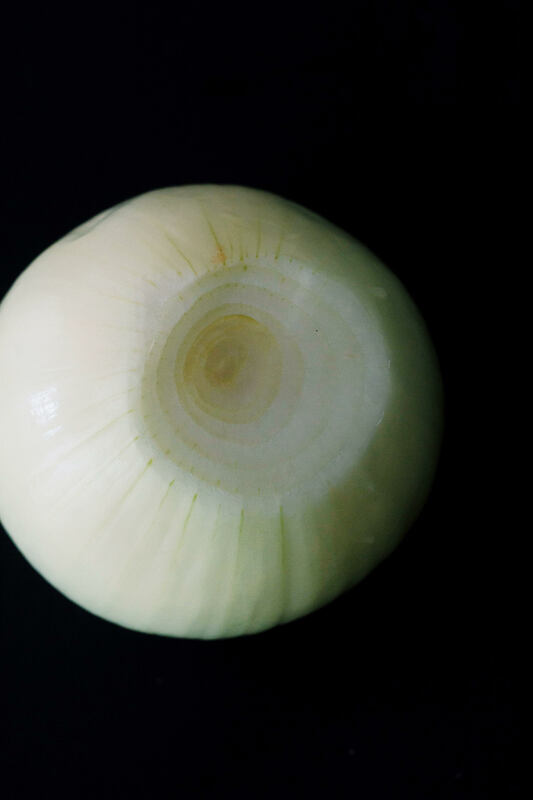 But the truth is, onions have their own kind of beauty to them. Their skins are russet and glistening, almost silky. They’re structured like tree rings (at least, I’ve always thought of them like that) and their taste is multifacted: sweet, pungent, bitter and when done right, almost buttery. In this soup, they are done right. 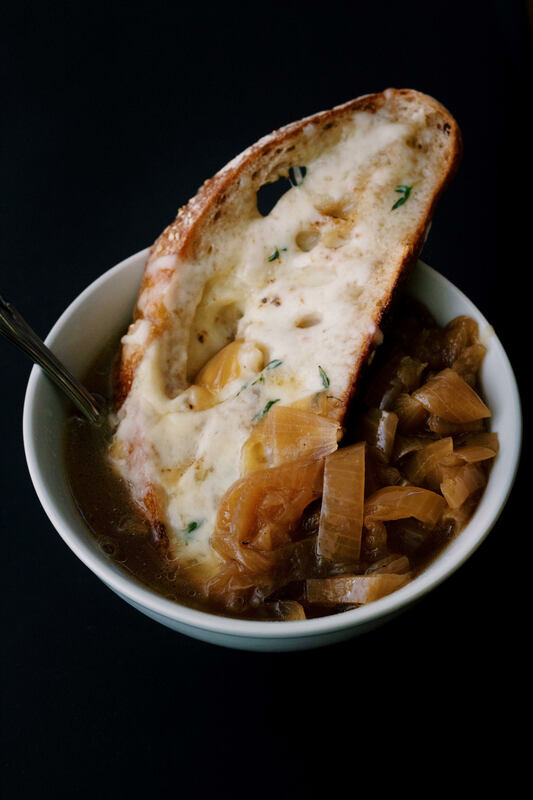 In fact, they are pretty much the only thing that is done: the soup’s flavor hinges on nothing more than deeply caramelized onions, dry white wine, and water. 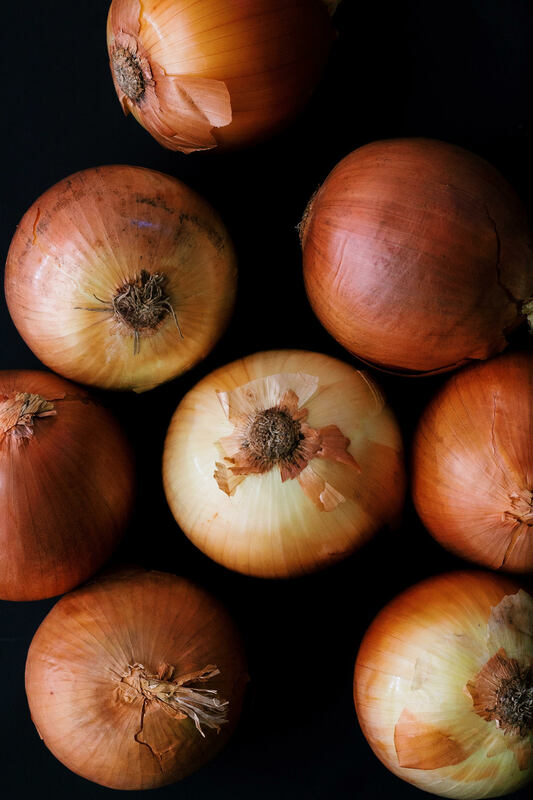 The water mingles with the wine and takes on the flavor of the onions, becoming, in essence, an onion stock, which not only eliminates the need for a different stock, but also condenses the flavor so that it is purely, unmistakably onion. Here, finally, the onions are given a chance to shine, be more than just mere background notes in a mirepoix or a braise. 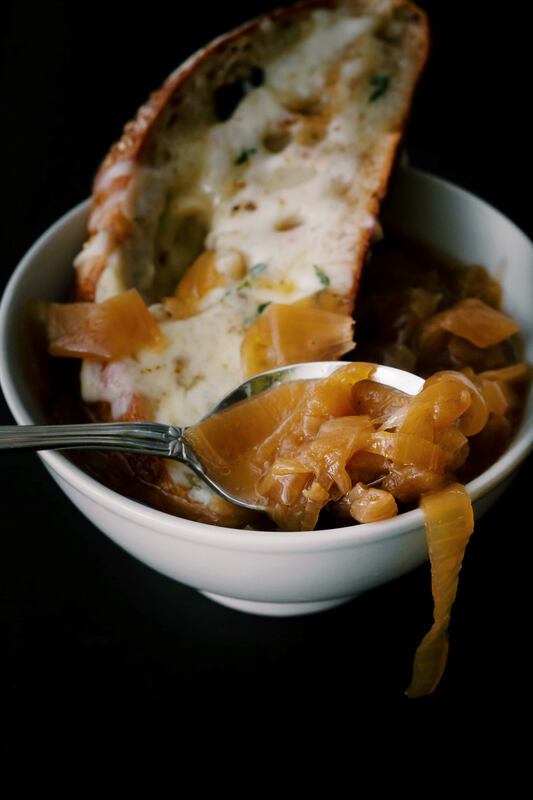 And yes, it is a bare bones soup in terms of ingredients, but in taste, well, it is all the better for it- sweet, intensely caramelized and heady with a slip of butter and glugs of wine. This is the sort of soup that works as well on a quiet Sunday as it does on a cold winter night. It demands time to savor it and not much else, besides, of course, the requisite gratinee of hearty bread and Gruyere on top. One sip and you will know. Onions are worthy of respect. And this soup is, too. Adapted from Lemon Fire Brigade, one of my favorite blogs! 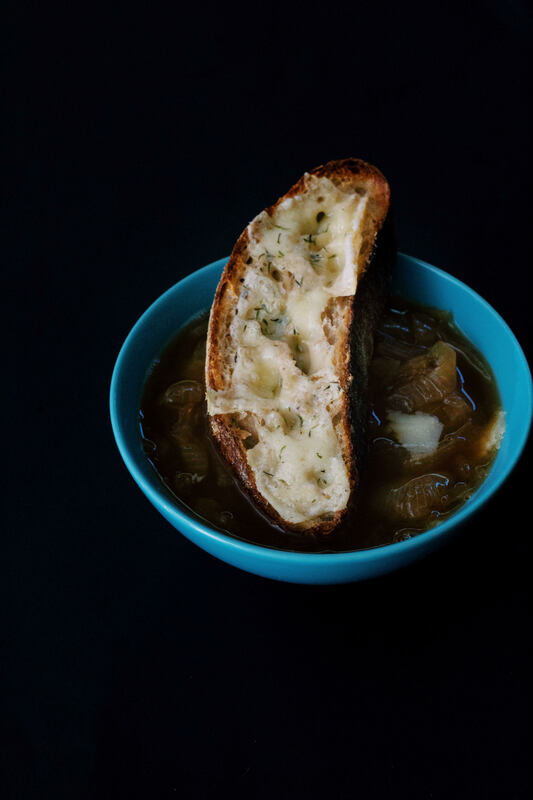 Why I love this recipe: what seems like an incredibly long caramelization time for the onions results in a tender, melt-in-your-mouth soup, which is composed of nothing more than white wine, water and a little butter, letting the true, sweet flavor of the onions shine. Topped with a gratinee of hearty sourdough bread + Gruyere, this soup becomes a cozy meal in itself. 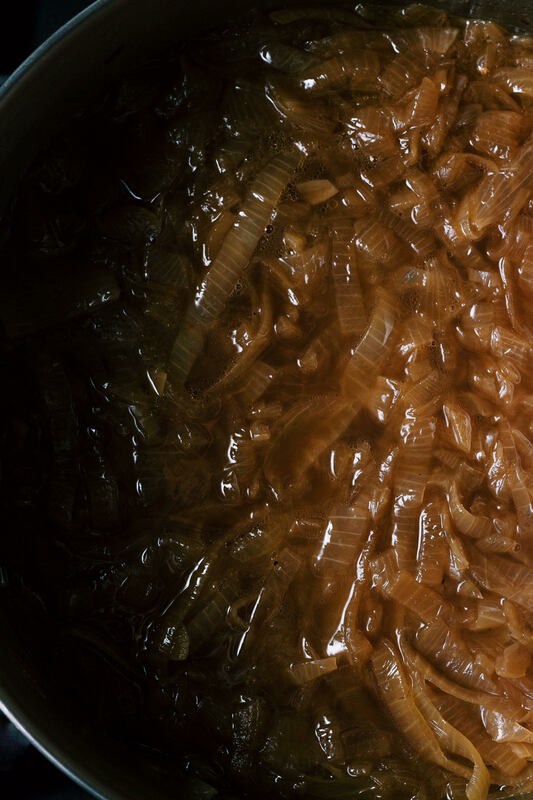 Notes: the onions for this soup must be so well caramelized that they will be a deep, dark brown, and a little scorched in places. Don’t let this scare you. They will open up and release the most wonderful flavor. 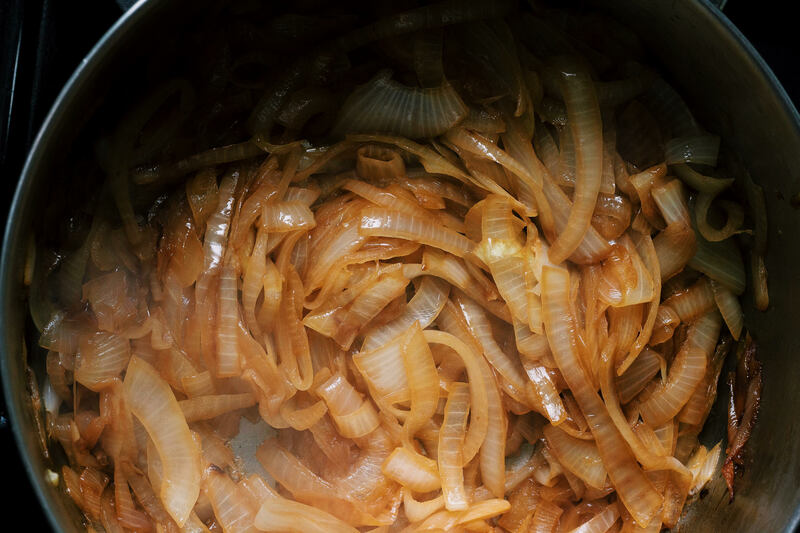 Your onions may need a few more minutes of caramelizing after they’ve been deglazed for the 4th time, so you can let them darken on high heat for a few more minutes, but don’t add more wine. Also, a note regarding the sheer amount of onions: you may need to caramelized them in two separate batches, at the same time. Simply divide the onions into two pots and proceed as written below, adding wine and butter and so forth, to each pot. 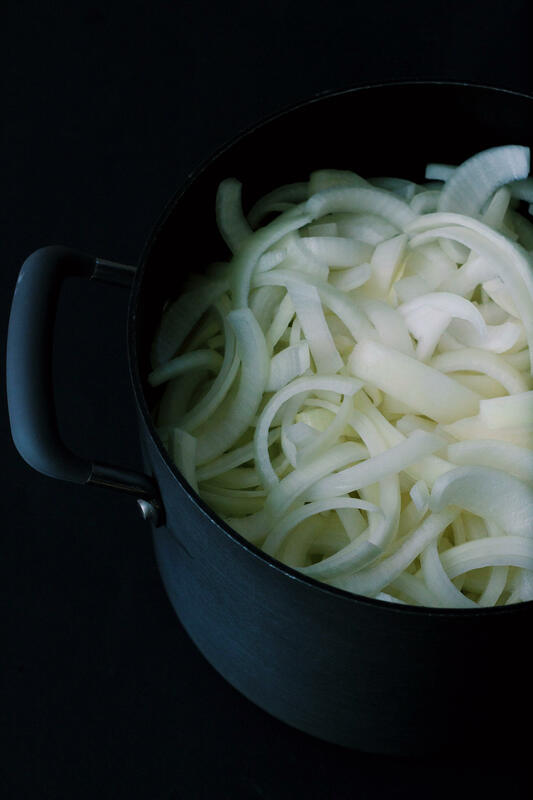 Combine the onions, olive oil, butter, and salt in a 4-quart sauté pan or Dutch oven. Cook, stirring occasionally, over medium heat until the onions are soft and translucent, about 10 minutes. Adjust the heat to medium-high, spread the onions over the bottom of the pot, and cook without stirring until the bottom of the pot begins to turn brown, about 5 minutes. Stir the onions with a wooden spoon to scrape up the browned bits. Add 1/2 cup of the wine and deglaze the pot, stirring to pick up any remaining browned bits. Continue cooking until the browned fond forms again. Scrape and deglaze the pot with another 1/2 cup wine and repeat the process 3 more times until the onions have slowly turned a deep caramel hue. Pour in the water, bring the pot to a simmer over medium-low heat, and cook until the soup is seasoned well from the caramelized onions, about 20 minutes. Taste to adjust for seasonings. Preheat the oven to 400º. Arrange ovenproof bowls over a rimmed baking sheet and ladle the soup into the bowls filling them almost to the rims. 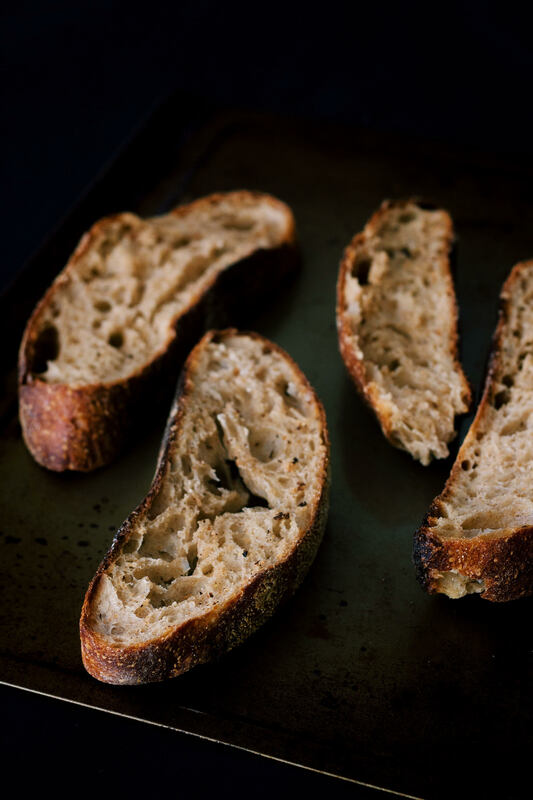 Place a slice of toasted bread onto each serving and top with the Gruyère and thyme. Bake until the cheese is bubbling, about 15 to 20 minutes, season with ground black pepper and serve. 08 Jan	This entry was published on January 8, 2013 at 10:39 pm and is filed under Delectables. Bookmark the permalink. Follow any comments here with the RSS feed for this post. so in the mood of this right now!!! looks amazing!